Michelle's Handcrafting Blog: What else you can do with an avocado, apart from eat it? What else you can do with an avocado, apart from eat it? 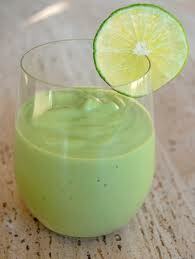 I bought some avocados last week to make a healthy smoothie, like the one I saw in a magazine. I blended all the ingredients together, then sat down to drink it, it tasted better than I thought and I was looking forward to drinking the next one. Well that thought was short lived, I started to feel queasy and ill. It got to the point that I had to lie down and take some medication. After a couple of hours I started to feel better, don't get me wrong, I've eaten avocados before, these ones had ripened perfectly, but for some reason I felt so poorly, after drinking this smoothie, on that day. I now had to decide what to do with the remaining three avocados. I hate wasting food, so I was not going to throw them away. I got onto the internet and had a look to see what else you can do with an avocado. Then I thought. what about a hair or beauty treatment? I do like using natural products and I was in luck. 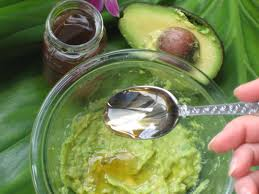 After browsing various websites, I decided to try and make a avocado and honey facemask, as I'd not done a facemask for goodness knows how long. 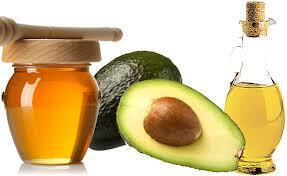 Also there was recipe for a avocado, honey and olive oil hair mask. Everything was placed in a bowl and mashed and mixed up with a fork, till it was a smooth consistency. I applied it to my washed hair, it did feel strange, a little voice in my head was saying 'what are you doing, your putting food on your hair'. Once I smeared it all over from root to tip, I covered my head with a plastic cap, it had to stay on for 30 minutes. I mixed it all together and smoothed it on to my face, this needed to stay on for 15 minutes, my face soon started to feel tight and sticky. After I rinsed it all off, I noticed how soft and smooth my skin felt. After 30 minutes, I washed out the hair mask mixture, must say it took a while to do this, but afterwards, wow, my hair had never felt softer and shiner, I was stunned. I'd done other hair treatments before, but never had such a result like this one. The ingredients totally rehydrated my hair, it was amazing. I will continue to use these ingredients on my hair and face, the results speak for itself. All the ingredients are natural, with no harsh chemicals and are inexpensive. Avocados contain nearly 20 vitamins and minerals, including potassium and is rich in vitamin A, E and D.
Honey is gentle on the skin, a good choice if you have sensitive skin. It is also a natural humectant, which means it attracts and retains moisture. Both these ingredients are good for nourishing and moisturizing dry skin and hair. Olive oil adds moisture to your scalp if you have a dry scalp, it also softens dry frizzy hair and helps to promote hair growth. I'm already use olive oil in my hair and I've noticed how it's improved the condition of my hair. Right, I'm off to see what else I can conjure up in my kitchen.